Formulated to promote balanced gut and vaginal flora. More than 5 billion Lactobacillus acidophilus per dose. Effective for treating a number of gastro-intestinal problems. An imbalance in intestinal and vaginal flora can encourage the pathogenic potential of the body's natural bacteria. A number of factors can lead to such an imbalance, particularly the use of antibiotics or an upset to the immune system. 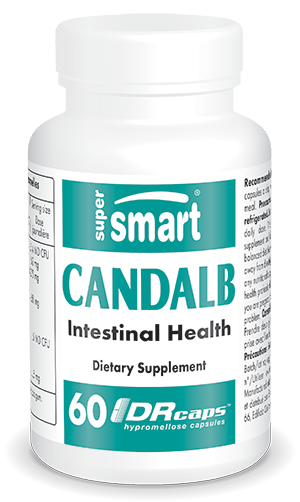 Candida albicans is a yeast which is naturally present in the body, particularly in intestinal and genital mucous membranes. In certain circumstances, Candida albicans can become pathogenic and cause infections ranging from superficial to systemic mycoses. Candida albicans is actually responsible for over 70% of the vaginal infections which affect most women at least once in their lifetime. - serrapeptase, a proteolytic enzyme, which helps reduce toxins in the intestine and reactions to foreign bodies. It also boosts antibiotic efficacy. Other ingredients : magnesium stearate, cellulose, maltodextrin, silicon dioxide. Adults : take two capsules in a single dose with a main meal, every day for a month. Repeat as necessary.